I’ve been quiet on here for a while but have been busy adding digital scrapbook kits to my shops on Etsy and Creative Market. One of the kits has indigo blue shibori patterns, developed from both tie dyed fabric and paper. 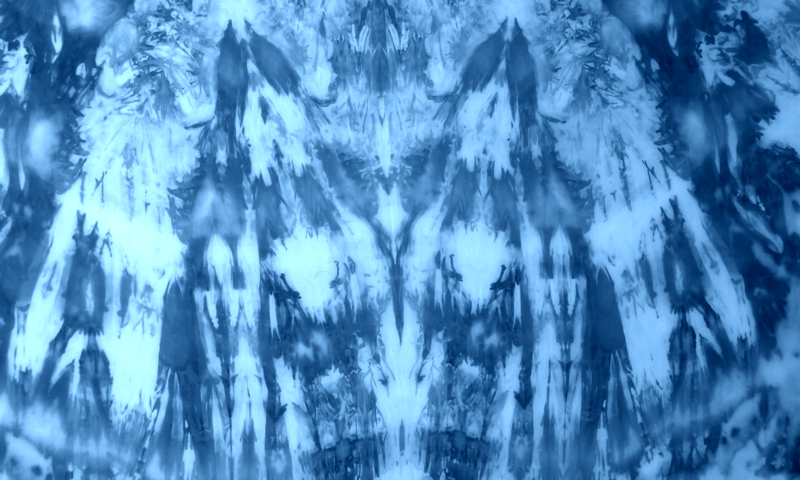 Shibori is a Japanese tie dyeing method of making patterns, usually in indigo. In Japan, this traditional art has some amazingly complex stitching designs: the act of gathering the fabric acts as a resist so that the dye only reaches the parts that haven’t been gathered tightly. Sometimes it is pleated and clamped. When I did my City & Guilds in patchwork and quilting we wrapped it tightly round pieces of drainpipe and pushed it down really hard then poured the dye over it. This produced some really striking patterns. Here is the account of how I dyed one of the patterns in the kit. I have a book by Yoshika Wada called Shibori: the Inventive Art of Japanese Shaped Resist Dyeing. The patterns shown there are varied and awesome. My patterns, in comparison, are relatively simple. I’ve mixed them with watercolour stripes and dashes. I’ve got a Shibori board on Pinterest if you would like to see lots of examples. Apparently the word ‘shibori’ comes from the verb shiboru which means to wring, squeeze or press, and denotes the process of manipulating fabric, treating it as a 3 dimensional form rather than a 2 dimensional surface. Michelle Griffiths, a textile artist based not far from here in South Wales, makes amazing sculptural textile designs by leaving the cloth in this dimensional form. I’ve pinned some photos of her work on the board on Pinterest. The digital files in my kits can be used for scrapbooking, digital journaling, wedding invitations, to make envelopes and other stationery, or as blog backgrounds or for the new style Etsy cover photos. I uploaded one of the patterns to Spoonflower and ordered a metre of it when they had a half price sale on their eco canvas. Here it is hanging on my design wall. I think I’m going to make a bag out of some of it – I quite like this design. I like the faint, subtle markings where the dye just stained the paper a bit as well as the more vibrant parts. For a while now, I’ve been trying to decide which direction to take my art, and have been gradually accumulating a huge pile of scanned textural papers from playing around in my studio. Exciting news – for the last couple of weeks I’ve been working hard developing digital downloads from my painted and printed papers. I’m planning to sell them in my Etsy shop as kits for digital scrapbooking and art journalling. The big unveiling is being planned for Saturday 14 November! If this is something that you might be interested in, sign up for my newsletter, where I also plan to offer subscriber-only discounts and freebies. There will be an extra special discount for the opening weekend!